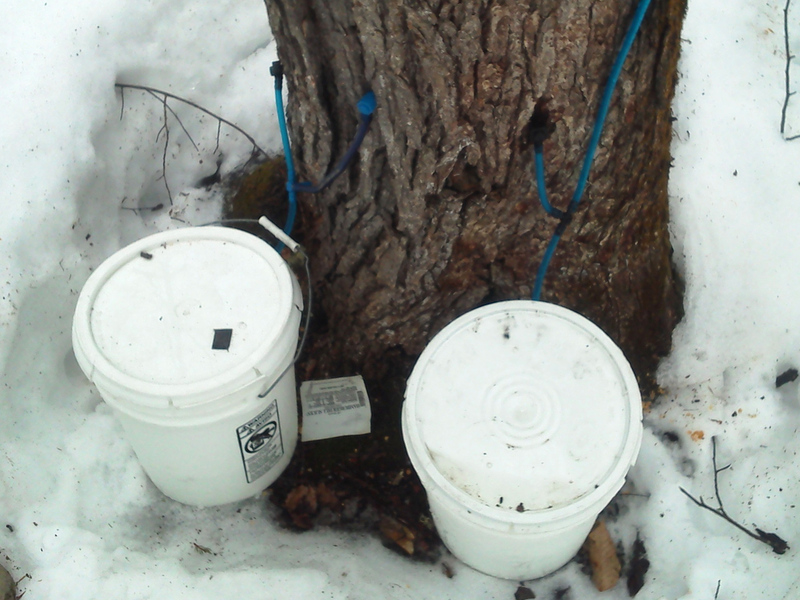 PORTLAND, Maine Sticky-fingered thieves are stealing the sap right out of Maine's maple trees. With little more than a spout-like tap and a bucket, people are looting the liquid out of trees on private property and hauling it away to turn into sweet maple syrup. There's been an increase in reported sap thefts the past couple of years, but Maine Forest Service rangers aren't sure why. "It could be that landowners are more willing to contact us. But it also may be that more people are venturing out into the woods to try their hand at this," Ranger Thomas Liba said. Syrup is big business in Maine between late February and mid-April, when conditions are just right for sugar makers to extract sap from maples and boil it down to syrup over wood fires. The state last year produced 360,000 gallons, tying it with New York as the No. 2 syrup-producing state. Vermont, the top state, produced 750,000 gallons. At $50 a gallon or more on the retail level, Maine-made syrup is pricey, selling for 13 times the price of gasoline. The price varies slightly from year to year, but it has not been showing an upward trend in recent years. Syrup-related thefts are nothing new. Just this week, a Vermont syrup-maker reported the theft of equipment from his sugarhouse. And Maine's sap thefts are small potatoes compared with syrup heists that have been reported elsewhere. Thieves last fall stole nearly $20 million worth of syrup from a Quebec warehouse that stocked thousands of barrels of the amber liquid. Still, the thefts raise the hackles of rangers and landowners alike: The sweet-toothed swindlers aren't just trespassing, they're damaging valuable trees. Violators often use drill bits that are 7/8 of an inch, nearly triple the industry standard of 5/16 of an inch, to drill holes for the taps, Liba said. They're also using PVC piping that gouges the trees, and putting four taps in trees that should have only two, thereby creating undue stress on the trees. With gouges and large holes, the trees are more susceptible to decay and disease. And they also carry less value in the marketplace. The best maple trees are highly sought-after for veneer used in making cabinets and furniture or as logs that are suitable for processing at a sawmill. But when the trees are damaged they're only suitable for less-profitable uses, such as pulpwood for pulp plants or for biomass plants. "If you're talking dozens of trees with illegal taps that have suddenly been lowered potentially to firewood, the impact on the landowner's wallet could be in the thousands," Liba said. Illegal taps have been showing up here and there on land managed by Millinocket-based Katahdin Forest Management LLC in the Maine North Woods, said company president Marcia McKeague. The tapping operations typically involve 20 to 100 taps, usually by people who simply pull up alongside a logging road and drill holes into the closest trees, she said. They then catch the sap in buckets, milk jugs and other containers. "For us it falls into this big category of things people not showing respect for adjacent property. They probably wouldn't dream of tapping their neighbor's trees," McKeague said. Or maybe they would. In eastern Maine, taps showed up in trees at a cemetery in Calais. "That was the first year they'd been put in trees at the cemetery, and that's what ruffled people's feathers," said Carmen Small, of nearby Robbinston. "Doing it at a cemetery is sacrilegious and disrespectful. It freaked my husband out because his family's buried right under one of the trees." The taps were removed after Calais city workers left a note asking their owner to take them away. Liba said he's not aware of anybody being criminally charged for illegal tapping, but he caught one person in the act this year. That man is now working with the landowner and a mediator on how to make amends. People sometimes think because Maine has a long tradition of open access to land for hunting and fishing, the right extends to other things as well  including tapping trees, Liba said. "I think they're viewing it as an extension of being able to go out and use property without permission," he said.